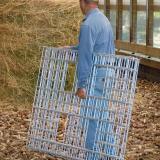 Note: We are now selling Big Bale panels, hinges and snap clips individually. This way you can design according to your situation or need. 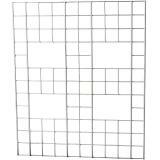 How many panels, hinges and clips you will need? See "Customization" below. To feed sheep large round or square bales. 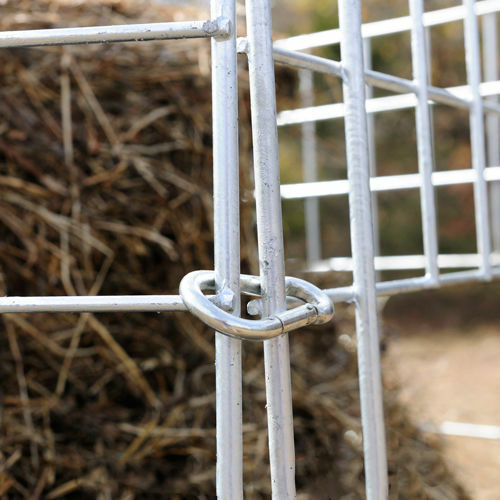 How many panels, hinges and clips are needed for a bale? Folds flat—easy to store and move. Adult sheep can’t get inside it. 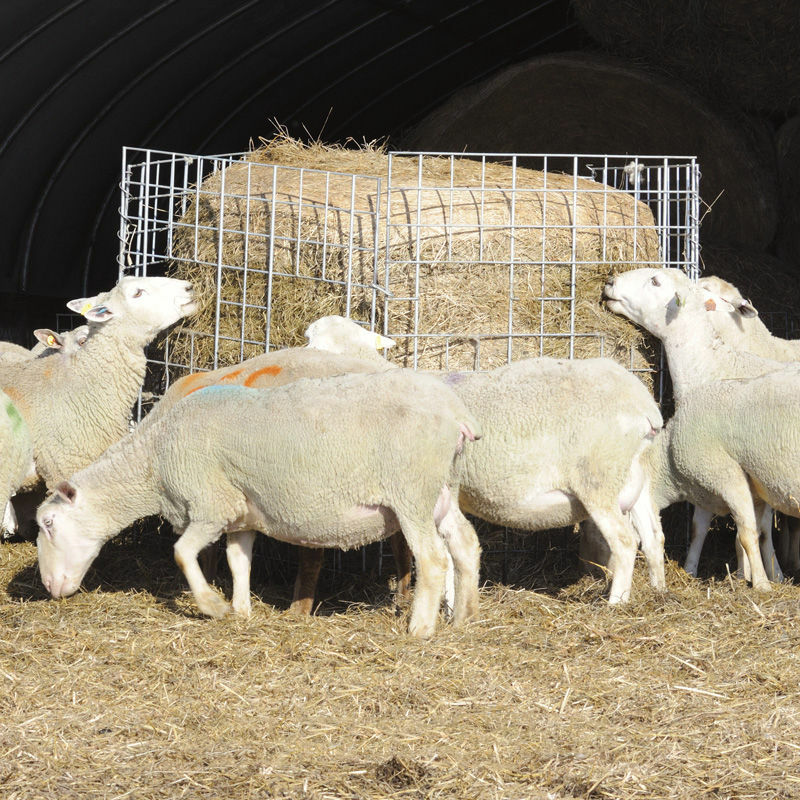 Average of 40 ewes per 6 panel feeder is advised. (Too many ewes will cause fighting for access.) 1200 lb hay bale should last about 5 days. More durable than feeders made with farm-store wire panels. 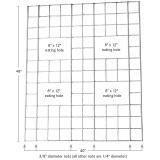 Adapts to most round or square bale sizes­. Not for use with cattle, horses or horned animals. Ships to you by UPS™/Spee-Dee™. Can pay for itself in 1 year… Calculating the lost $$ due to wasted hay provides a picture of the relative value of a big bale hay feeder. 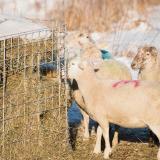 Assume 40 ewes eat 5 lbs of hay for 165 days. 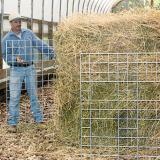 Assume hay costs $140/ton (7¢/lb). 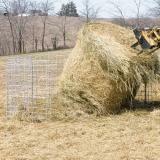 Big Bale Feeder— 10% wastage, $231 wasted hay. Other Feeders— 25% wastage, $577 wasted hay. 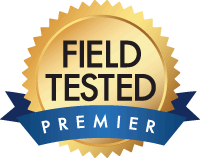 So, the $346 difference pays for a Premier feeder—in only 1 year! Tip: To eliminate risk of sheep tipping over an empty feeder and thereby injuring themselves, drive a single steel post into the ground and secure 1 corner of the bale feeder to it. The post can stay in place all winter. Having noted that we rarely do this. We simply allow the sheep to tip the feeder over. Our last injury was 4 years ago—and we use 20 feeders all winter long. Don’t use them for cattle or horses. 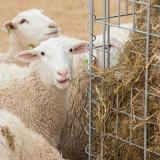 Horned sheep or goats won’t damage the feeder but they may get their heads caught. Don’t lift the feeder with the tractor loader. This puts unnecessary stress on the welds. Don’t let panels freeze to the ground. 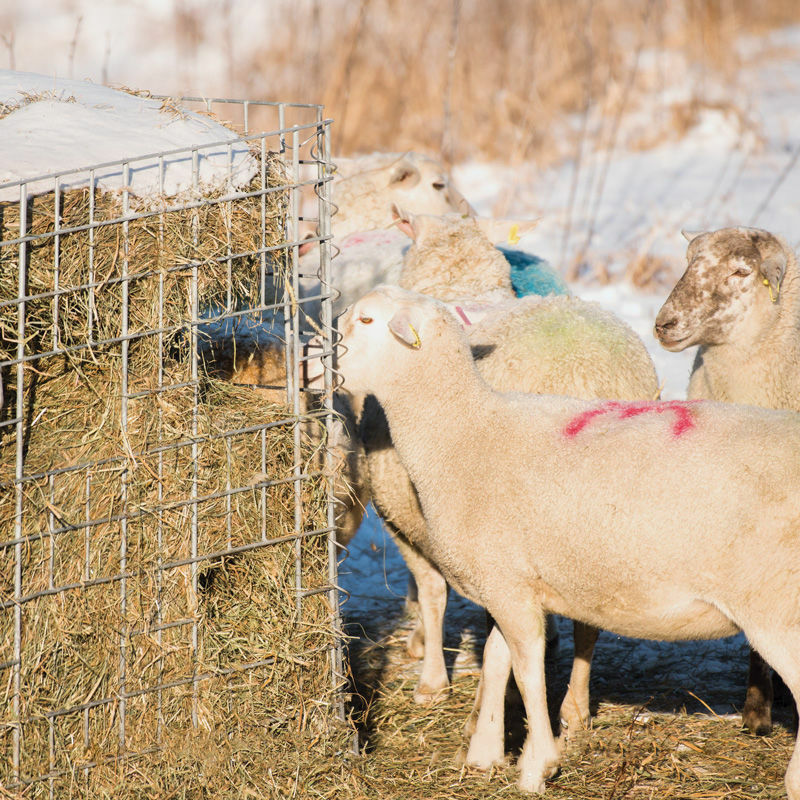 Don’t feed more than 40-50 ewes per feeder. Too many ewes per feeder may cause them to fight for access—which can result in poor-doing (or even dead) sheep. Recommended: 24 out of 27 said they would recommend this product to a friend. We had a hay waste problem with our old feeders so we came up with a solution, our Big Round Bale Feeders. We don’t know what we would use to feed our sheep with if we didn’t have these. We recommend not lifting them with the forks of a tractor. 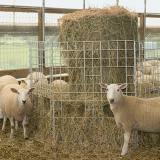 Once the sheep clean up a bale, we move the feeder to a different spot to prevent waste building in only one area. 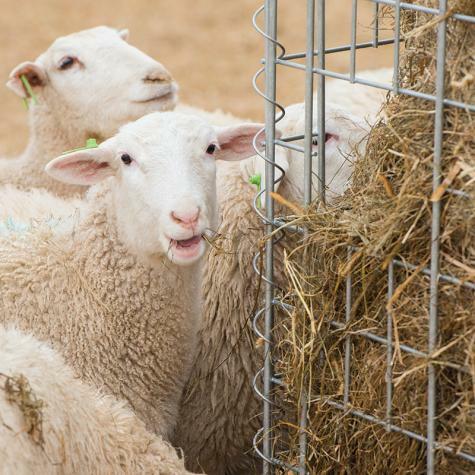 We love… Read More » these feeders, they pay for themselves by reducing waste. This is our second Big Bale Feeder. We've had two other brands. The first, a blue one, was pathetic. It allowed way too much waste and lambs would crawl in and play on the bales. 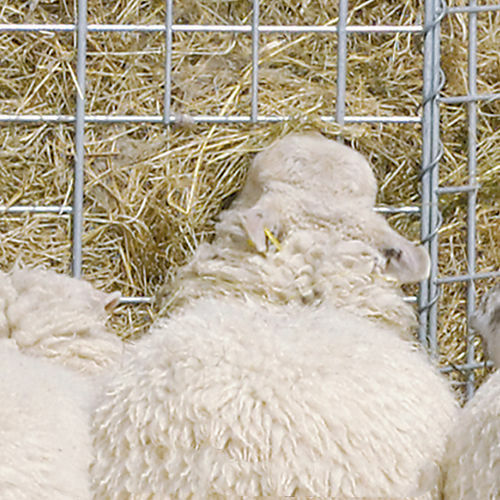 The second, a red one, was immensely better but if a bale was of poorer quality, the sheep tend to not eat the bottom of the bale which won't allow the feeder to move into the bale, but not a bad feeder. 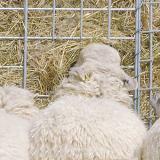 The Premier allows the adult sheep to put there head into the feeder to eat into the bale, it keeps all lambs out, and the bale is consumed entirely. 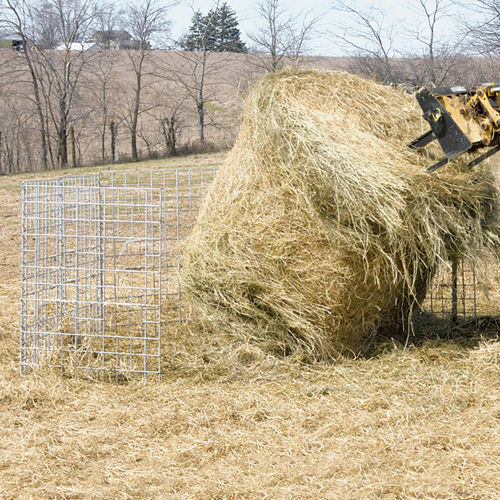 These bale feeders are AMAZING! We were feeding a bale per week to each group of approx. 25 does and now a bale lasts at 3+ weeks. My only regret is we didn't buy these sooner. They will more than pay for themselves this winter. We have mostly horned goats and have not had any problem with them getting caught. I have lost count of the different feeders I have tried to save hay when feeding my herd of 50+ goats. Nothing seemed to work until I purchased a Big Bale Feeder! I now own three of them. 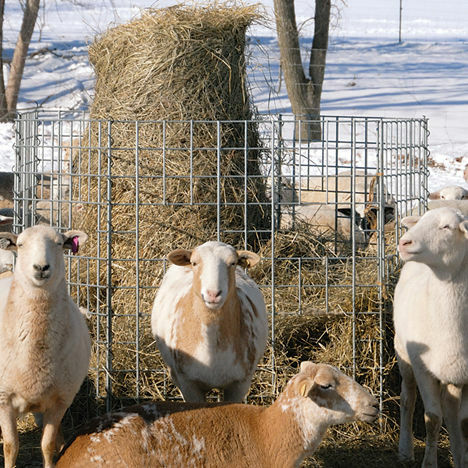 If you own goats, you know how much hay they can waste. I was feeding a round bale a week to my senior doe pasture. After purchasing my first Big Bale Feeder, I am now buying one every three weeks. At this rate the feeder will pay for itself in jus a few months. 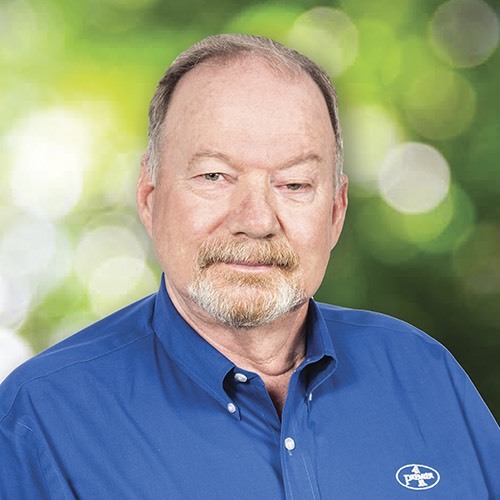 While it does not totally eliminate waste, it has certainly made a huge difference. I would certainly recommend this product to anyone with goats. I even use it with my horned goats and have not experienced any problems. I'm very pleased with this feeder. Nice, heavy duty panels but light enough to move. With this drought I had to do something to save on hay. I would say a bale is lasting 3 times longer in this feeder. The hay has some course stems in it but I just pull those out every couple days and they do a pretty good job of cleaning up the good stuff. 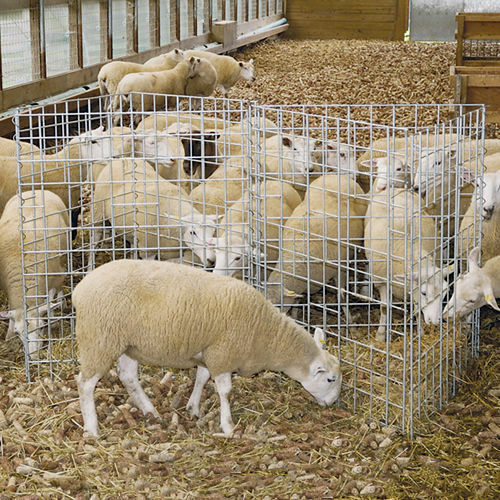 we normally feed small squares but with the dry august we had a shortage of squares decided on this feeder because of cost vs others on the market easy to set up by your self very little waste probably less than 10% also very durable and no worry about lambs getting into the feeder to get injured worth every penny it costs.